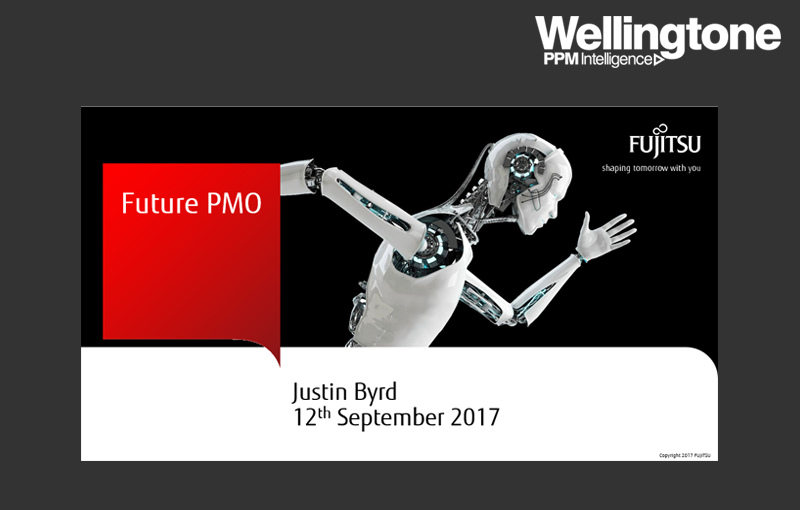 Justin used his workshop to explore what a good PMO looks like, how should it be designed to add the most value for its Customers and how you can ensure it is fit for purpose not only today, but for the future of your organisation too. Delegates left with hints, tips, and ideas to enhance their PMO journey. Great fun attending the first ever Future PMO conference in London; what a day, time machines, robots with water jets, fascinating insights, PMO experts and TV personalities, you couldn’t pack much more into one hotel or one day! It was really inspiring to be in the company of so many industry gurus, all praising the work of PMO and learning from each other’s experiences. It was good to have a full audience for my presentation that took delegates through Fujitsu’s PMO journey from humble beginnings with disparate PMO activity into what is now the EMEIA Portfolio Office; a well-oiled machine of over 200 PMO professionals all delivering standardised, repeatable, defined and fully supported PMO services. Questions from the floor were both engaging and challenging so it proved people have a genuine interest in learning from each other to better shape and guide their own PMO journeys. I loved being part of this open, informal, educational and informative event, there was a real thirst for knowledge and a genuine feeling of community amongst both the speakers and delegates. I left the day feeling part of something far greater than where I started; a true community spirit to ensure PMO has its place on the map but not only that it has a bright and interesting future which is in our hands to create. Can’t wait for next year! Very insightful, as he runs a very diverse PMO. Lots of hints and tips and take aways for improving PMO success. Don’t forget to pre-register for FuturePMO 2018 to be the first to know when Early-bird tickets go on sale!